This volume of new essays by leading scholars treats a representative sampling of German realist prose from the period 1848 to 1900, the period of its dominance of the German literary landscape. It includes essays on familiar, canonical authors -- Stifter, Freytag, Raabe, Fontane, Thomas Mann -- and canonical texts, but also considers writers frequently omitted from traditional literary histories, such as Luise Muhlbach, Friedrich Spielhagen, Louise von Francois, Karl May, and Eugenie Marlitt. 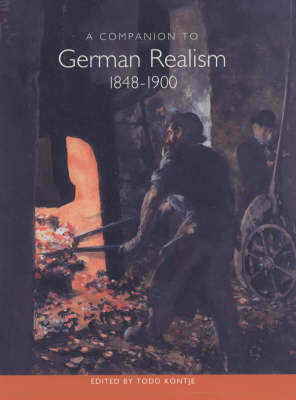 The introduction situates German realism in the context of both German literary history and of developments in other European literatures, and surveys the most prominent critical studies of ninteenth-century realism. The essays treat the following topics: Stifter's Brigitta and the lesson of realism; Muhlbach, Ranke, and the truth of historical fiction; regional histories as national history in Freytag's Die Ahnen; gender and nation in Louise von Francois's historical fiction; theory, reputation, and the career of Friedrich Spielhagen; Wilhelm Raabe and the German colonial experience; the poetics of work in Freytag, Stifter, and Raabe; Jewish identity in Berthold Auerbach's novels; Eugenie Marlitt's narratives of virtuous desire; the appeal of Karl May in the Wilhelmine Empire; Thomas Mann's portrayal of male-male desire in his early short fiction; and Fontane's Effi Briest and the end of realism. Contributors: Robert C. Holub, Brent O. Petersen, Lynne Tatlock, Thomas C. Fox, Jeffrey L. Sammons, John Pizer, Hans J. Rindisbacher, Irene S. Di Maio, Kirsten Belgum, Nina Berman, Robert Tobin, Russell A. Berman. Todd Kontje is professor of German at the University of California, San Diego.